Win two tickets to immersive theatre show 2084! It is the age of total surveillance. Everything you say or do is scrutinised and recorded. Even your innermost thoughts are probed. You cannot be too careful; there are enemies everywhere. Welcome to the Future. 2084 will plunge you into an authoritarian world where you will learn to identify traitors and expose their thought crimes. Enter now to win a pair of tickets to this unique immersive performance! 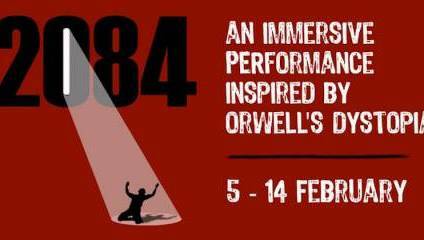 2084 runs from 5-14 February at Manchester Central Library. 1. London Calling reserves the right to amend the competition end date at any time. 5. Prize will be a pair of tickets valid on all performances.